Family History research can be addictive, but it can also be a lonely pursuit if you can’t get other family members on board. For today’s prompt, how about reaching out to another family member, maybe your favorite cousin, a sibling or an uncle or aunt, and encourage them to share their own memories. Maybe if you start out slow you can eventually reel them in. Take a few moments to compose five questions you’d like to ask your new collaborator. 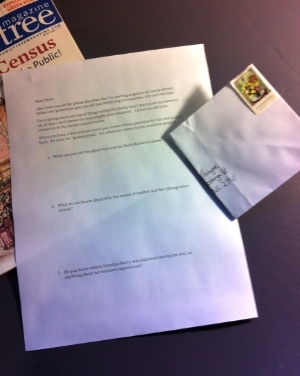 You can pose these by phone or by email, but I’ve gotten the most comprehensive answers by snail mail. Maybe it’s because we pay more attention to personal mail that lands in our mailboxes these days since it’s becoming a less frequent occurrence. A good format is to write (or type) the question and then leave a big blank space. There’s something compelling about it and people seem to feel the need to fill it. Also, it's a good idea to include a SASE. It saves your collaborator the hassle of a trip to the post office, plus you show you value their input by springing for the price of a stamp. Try to frame your questions in an open-ended form to elicit the most info. Example: You want to know about the scar on Uncle Richard’s cheek? If you ask: How did Uncle Richard get that scar on his cheek? the answer may come back: In the war. Whereas if you ask: What can you tell me about that scar Uncle Richard had on his cheek? you may get a more elaborate response.